Yeah, we know Cinco De Mayo is past, but we had a few emails about more recipes inspired by Mexican cuisine. Here ya go, compliments of the California Milk Board. Melted California Mozzarella and crumbled California Cotija give this hearty appetizer a rich cheesy flavor. For dipping, use tortilla, pita and bagel chips. If you prefer vegetables, try carrot sticks or sugar snap peas. In a medium skillet, heat oil over medium heat. Add onion, garlic and jalapeño peppers; sauté until onions are soft, about 5 minutes. 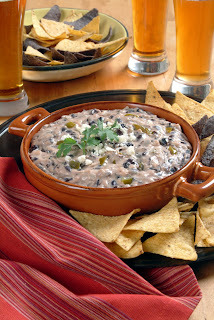 Add the beans and smash with the back of a ladle or large spoon until softened and heated through, another 2-3 minutes. Remove from heat and stir in pre-shredded Mozzarella or Oaxaca, sour cream, cumin and cayenne pepper, stirring until cheese is melted. Season with salt and pepper to taste. Transfer to a serving dish and sprinkle Cotija cheese on top. Serve warm or at room temperature with chips and vegetables. 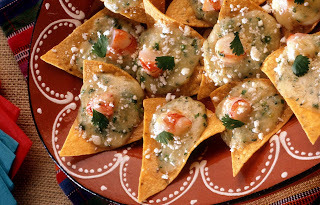 This delicious and surprising twist on traditional nachos replaces ground beef with shrimp and creates an authentic note with the addition of two readily available Hispanic-style cheeses – Queso Blanco and Cotija. In medium bowl, stir together Queso Blanco cheese, mayonnaise, shrimp, onions, chipotle puree, chopped cilantro, lime zest and cumin. Spread about 1 tablespoon mixture onto each tortilla chip and place on a baking sheet. Broil until mixture begins to brown, about 1 minute. Sprinkle each with a generous teaspoon of Cotija cheese. To serve: put a cilantro leaf on each nacho and serve immediately.